Frankl Kominsky Injury Lawyers - Never Settle for Less. The accident lawyers at Frankl & Kominsky provide exceptional advocacy and representation to people throughout South Florida who have been hurt by the careless conduct of another person or entity. Based in Palm Beach County, we are experienced litigators with a passion for the law and a commitment to our clients. We never settle for less than what our clients need to move forward after an accident. Instead, our Boynton Beach personal injury lawyers aggressively pursue our clients’ interests to help them receive a favorable outcome. We have helped our clients recover damages for injuries in motor vehicle accidents, premises liability, products liability lawsuits, medical malpractice claims, and more. Based on our extensive litigation experience, we have gained valuable insight into the other side’s tactics. Our West Palm Beach personal injury attorneys can anticipate the strategies used by insurance companies, hospitals, and their lawyers to avoid liability. We have a proven track record of success, and are highly recognized for our accomplishments in the field. If you are hurt in an accident, you can file a personal injury claim against the party responsible for your harm. To hold that party accountable, you often will use the legal theory of negligence. Duty – The defendant must have had an obligation to meet a certain standard of care. Breach – The defendant must have violated this duty of care through careless actions. Causation – The defendant’s breach must have caused your injuries, which must have been reasonably foreseeable. Damages – You must have incurred actual damages as a result of your injuries. Some defendants will argue that the victim also acted carelessly. Even if this is true, Florida law allows a victim to recover at least some damages with the assistance of a personal injury attorney in the Boynton Beach area unless he or she bore complete responsibility for the accident. The state follows a pure comparative negligence standard. As such, if a victim’s carelessness contributed to his or her injuries, the resulting damage award will be reduced in proportion to his or her percentage of fault. Compensation can cover both economic and non-economic damages. Economic damages usually refer to objective forms of harm, such as lost wages, medical expenses, lost earning capacity, or damage to a vehicle. By contrast, non-economic damages cover more subjective types of harm, such as pain and suffering. obtained $50,000,000.00 in combined settlements. Vehicle accidents are unfortunately a common occurrence on Florida roads, and often leave victims with extensive physical injuries and financial burdens. However, a knowledgeable personal injury attorney in the West Palm Beach area can help you apply the negligence standard described above to recover damages. State law requires all motorists to use care in operating their vehicles. Drivers must abide by traffic rules and regulations while behaving in a way that does not needlessly endanger the safety of others on the road. If a motorist does not meet this standard and causes an accident as a result, the victim may hold the motorist liable for damages. Sometimes there may be more than one defendant who is responsible for your injuries. If you are hurt in a truck accident, for example, you may be able to sue both the driver and the truck company who hired the driver. The doctrine of vicarious liability attributes responsibility for an employee’s actions to his or her employer if the employee was acting in the scope and course of employment. Moreover, a truck company might be independently liable for engaging in negligent hiring practices or inadequately training its drivers. Your Boynton Beach personal injury attorney can investigate your specific accident and ensure that the appropriate parties are held accountable for harming you. Similarly, property owners in Florida have a duty to keep their premises safe for individuals lawfully on them. They must also repair or warn of any potential dangers and defects on the property. Property owners even owe a duty of care to certain trespassers, most notably children. If you or your child has been hurt on someone else’s property, such as a store, restaurant, or hotel, you should consider pursuing a premises liability lawsuit to seek compensation. At Frankl & Kominsky, our injury attorneys will aggressively pursue your right to compensation if you were hurt in an accident. Our West Palm Beach personal injury lawyers are skilled litigators with a deep understanding of substantive law and the judicial process. Whether we tenaciously battle through settlement negotiations on your behalf or carry your claim all the way to trial, you can depend on our commitment to never settle for less than what you deserve for your injuries. We serve individuals and families in Delray Beach, Boca Raton, Lake Worth, and West Palm Beach among other Florida communities. Call us today at (855) 800-8000 or complete our online form to schedule an initial consultation with a personal injury lawyer at our Boynton Beach firm at no cost to you. We are fluent in Spanish and Creole. 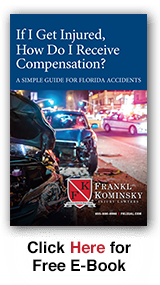 Download your free eBook today to understand the steps you need to take to get proper compensation for your injuries.